PYONGYANG, North Korea  North Korea's next leader burnished his diplomatic skills Monday, welcoming a private South Korean mourning delegation as state media revealed a new title that gives Kim Jong Un authority over political matters. Kim Jong Un has rapidly gained prominence since the death of his father Kim Jong Il on Dec. 17, and his brief meeting with a group led by a former South Korean first lady and a prominent business leader shows Seoul that he is assured in his new role. State media have showered Kim with new titles. On Monday, the main Rodong Sinmun newspaper described him as head of the Central Committee of the Workers' Party  a post that appears to make him the top official in the ruling party. That came two days after the North referred to him as "supreme leader" of the 1.2 million-strong armed forces and said the military's top leaders had pledged their loyalty to him. Late Monday, Pyongyang's official Korean Central News Agency also called Kim a "sagacious leader" and "dear" comrade while reporting that he again paid respects to his father, whose body is lying in state at Kumsusan Memorial Palace. State media have already dubbed him as a "great successor" and an "outstanding leader." KCNA also indicated that Kim will uphold his father's trademark "military-first" policy. "As dear comrade Kim Jong Un, who is a sagacious leader of our party, state and military, is at the forefront of our revolutionary cause, the history of our father and general's glorious military-first revolution will continue," it said. Also on Monday, Kim met a private delegation of South Koreans and gave them his thanks after they expressed condolences and sympathy over his father's death. 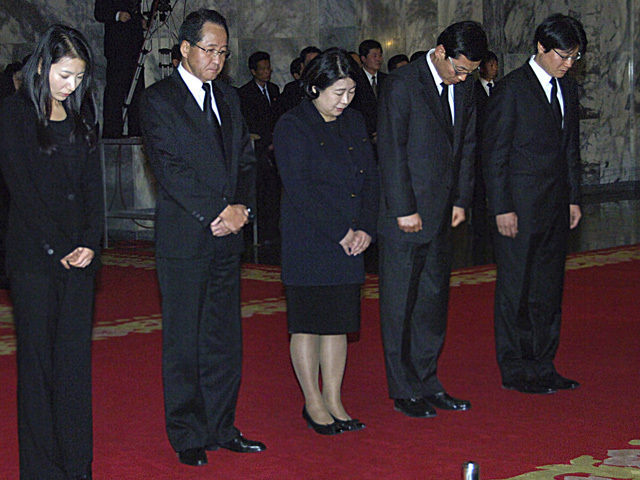 The lead delegates were the widow of former South Korean President Kim Dae-jung, who engineered a "sunshine" engagement policy with the North and held a landmark summit with Kim Jong Il in 2000, and Hyundai Group Chairwoman Hyun Jeong-eun, whose late husband had ties to the North. North Korea sent delegations to Seoul when the women's husbands died. They stood in a line on a red carpet and bowed silently during their visit to the Kumsusan palace, where Kim Jong Il's bier is surrounded by flowers and flanked by an honor guard, footage from AP Television News in Pyongyang showed. Kim Jong Un and the two women later exchanged handshakes and clasped their hands when they had brief conversations, the footage showed. Their conversations were inaudible. Through the meeting, Kim appeared to have sent a message pushing South Korea to pursue previously agreed upon cooperative projects that would give his country much-needed hard currency, said Yang Moo-jin, a professor at Seoul-based University of North Korean Studies. Monday's meeting appeared to be Kim's first meeting with South Koreans since his father's death. It was also the fourth time the North's media reported that Kim had visited the memorial palace since his father's death, according to Seoul's Unification Ministry. On Tuesday, the two lead South Korean delegates met Kim Yong Nam, president of Presidium of North Korea's parliament, who often represents the country and is considered a nominal head of state, according to the APTN footage. The delegates were to return to South Korea later Tuesday. The Kim family has extended its control over the country of 24 million people to a third generation with Kim Jong Un, who is in his late 20s and was revealed last year as his father's choice among three sons for successor. Kim Jong Il, who ruled North Korea for 17 years, wielded power as head of three main state organs: the Workers' Party, the Korean People's Army and the National Defense Commission. His father, North Korea founder Kim Il Sung, remains the nation's "eternal president" long after his 1994 death. Kim Jong Un was named a vice chairman of the Central Military Commission of the Workers' Party last year, but was expected to ascend to new military and political posts while being groomed to become the next leader. Monday's reference to his new title was in commentary in the Rodong Sinmun newspaper, the mouthpiece of the Workers' Party, urging soldiers to dedicate their lives "to protect the party's Central Committee headed by respected Comrade Kim Jong Un." Rodong Sinmun has also called on the people to become "eternal revolutionary comrades" with Kim Jong Un, "the sun of the 21st century." The language echoed slogans used years ago to rally support for Kim Jong Il, and made clear the son is quickly moving toward leadership of the Workers' Party, one of the country's highest positions, in addition to the military. North Korea refers to Kim Il Sung as the "sun" of the nation and his birthday is celebrated as the "Day of the Sun," and state media have sought to emphasize Kim Jong Un's role in carrying out the Kim family legacy throughout his succession movement. His titles are slight variations of those held by his father, but appear to carry the same weight. It was unclear whether the nation's constitution had been changed to reflect the transfer of leadership as when Kim Jong Il took power after his father's death. Mourning continued, meanwhile, despite frigid winter weather, in the final days before Kim Jong Il's funeral is set to take place Wednesday and a memorial Thursday. People continued lining up Monday in central Kim Il Sung Square, where a massive portrait that usually features Kim Il Sung has been replaced by one of Kim Jong Il, to bow before his smiling image and to lay funereal flowers. Heated buses stood by to give mourners a respite from the cold, and hot tea and water were distributed from beverage kiosks.